Most of what we are as sentient life-forms comes in twos - legs, arms, ears, eyes, etc. If we lose one we can still function at a reduced efficiency. Since Hans Lippershey invented the telescope, at the beginning of the seventeenth century, we have been pursuing visual astronomy with monocularity. Why have amateur and professional astronomers, over the centuries, been content to visually observe our three-dimensional universe with only two-dimensional clarity? We do not perform our daily tasks with one eye closed. So why do we view our universe in such a manner - dogma, habit, tradition, practicality, cost factors, or all of the above? To try to explain this ineffable binocular experience is almost impossible. I don't need to sell anyone on the concept of stereo sound over mono sound. Everyone knows the realism attained with a good stereo system. The same principle applies to stereo sight versus mono sight. The proof is in the experience - seeing is believing. 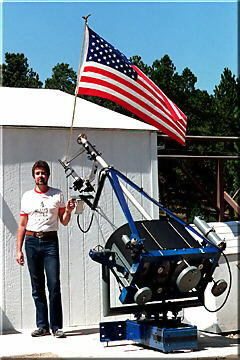 Before I built the 700-lb beast shown at right, I purchased a binocular viewing attachment to improve lunar, solar and planetary observing at public sessions in my observatory. The device worked so nicely that I yearned to view deep-sky objects in stereo as well. Being a fairly resourceful person and having read about Lee Cain's double-barreled creation, I took a look through the observatory's scrap pile to inventory the possibilities. I was able to scavenge enough material to at least build a sturdy mount. There were two major problems. The first was bulk. Lee's design was simply too bulky to be practical for my needs. So a tubeless design, that would lay almost flat, became mandatory (see picture at left). The other major problem was that I had only one 17.5-inch, f/4.5 primary mirror. It appeared that it would take a year or two to get a second one from the manufacturer. I was thinking of grinding my own mirror when a miracle happened. 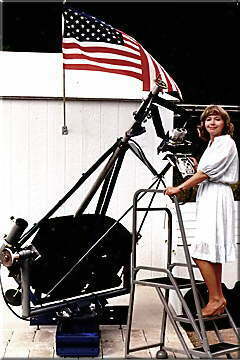 An amateur astronomer and a new resident of our area called my observatory and asked if I knew of anyone who would like to buy a 17.5-inch f/4.5 homemade Dobsonian. Well, this telescope was a "tank" and didn't thrill me at all, but the optics were mint. With two 17.5-inch f/4.5 mirrors at my disposal, an obsessed fanatic was created. Like the transformation of the "Hulk," I had no control over my metamorphosis. I began to eat, sleep and day dream about various aspects of design criteria. As with my previous telescope (see Four Speed 17.5-inch Newtonian, Sky & Telescope, Feb. 1986, p.199, or previous link), no designs were ever transcribed. All my plans were three-dimensionally displayed as a mental image. I don't know if this is a gift or a burden, but it sure saves a lot of time and paper. The actual construction proceeded with no unexpected design changes or unanticipated problems. Any one with a fair amount of common sense can design a telescope (or whatever) on paper and then have some job shop build a prototype. To reverse this process is a rare gift many amateur astonomers possess out of sheer necessity and/or an empty pocketbook. The innovation, and at times pure genius, of the ATM has always fascinated me. How anyone can take a bunch of gizmos and whazits, and create a celestial machine is indeed a miracle of our species. Society's discards, coupled with a group of motivated ATMs, could quite practically put a colony on Mars. THE MOUNT: All serious amateur astronomers understand the importance of a sturdy mount for studying the skies. A telescope, without a steady support, is only fun for a short while. After you've created all the quasi-laser light shows in the eyepiece from thumping various parts of your telescope, the fun is over. All you have left is frustration and disappointment. With binoculars designed for astronomy, the need for rigidity becomes doubly important. No effort was spared in the support of my binoculars. The azimuth axis has a 1.5-inch diameter steel shaft on double-tapered race roller bearings which I did not consider sufficient to dampen all vibration to ground. 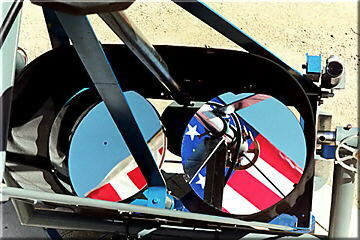 In addition, a 5/8-inch thick circular disc, fashioned from steel plate (probably a rejected flywheel blank from a scrap yard) is attached to the T-shaped base, and roller skate type steel ball bearings are mounted on each side of the tubular fork creating a thrust bearing stabilizer. 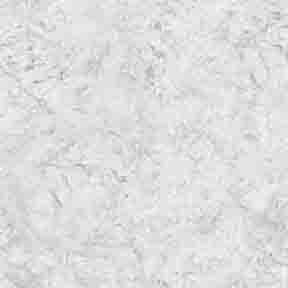 The amount of time for induced vibration to be transferred to ground by this design is negligible. Similar lateral support is also incorporated on the right ascension axis of BFO's 30-inch f/9 Cassegrain - but that is another story. The altitude axis has no bearings in the conventional form. It pivots on cannibalized hydraulic cylinders. I might add that hydraulic cylinders would make, in part or in whole, an inexpensive and extremely stable mounting, no matter what its configuration. THE MIRROR CRADLE AND CELLS: Again, I will stress the importance of structural rigidity in the assemblies associated with any binocular device - especially the primary mirror cradle. Structural cross-bracing is mandatory if the mount is to maintain optical alignment. Changes in altitude will create different stress points throughout the binocular's structure due to gravitational effects. This will disrupt the parallelism of the two optical paths unless strict care is applied to all structural considerations. 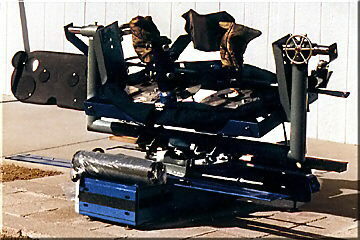 The mirrors are supported by conventional 9-point flotation cells, except for the motorized collimation adjustment on one of them. 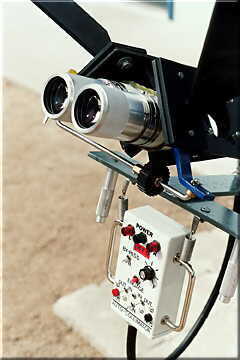 This system was added after field tests revealed the necessity of this feature. There are two reasons, of which the latter was the most important: 1) The thermal characteristics of the optics and the various ferrous and non-ferrous metals caused structural changes during the evening cooling process. From time to time, due to the changing ambient temperature, tweaking would be required to maintain proper collimation; 2) Some observers would see a perfectly merged image - others would not. Inter-ocular distance adjustment made no difference. I came to the conclusion that this was not the fault of the optical instrument, but the diversity of human physiology. I must conclude that each person perceives our universe literally from a different visual perspective. 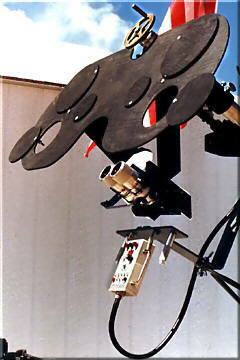 To simplify the motorized collimation, only two 60rpm 24vdc reversible gear-reduced motors were used. Activating both motors together conveys the action of a redundant third motor that would adjust the primary mirror vertically. The controls can be designed according to personal preference, and an LM317T integrated circuit (IC) can be incorporated to vary the motor speed. I recommend this IC over conventional rheostat controls as adequate current is supplied over the adjustable voltage range, thus maintaining higher motor torque at low rpm settings. THE SECONDARY-TERTIARY HEAD ASSEMBLY: This head has coarse and fine focus adjustment to accommodate any type of eyepiece or combination eyepiece/expander/compressor, etc. The coarse adjustment is controlled from the brass hand-wheel at the upper center of the head assembly (see picture at right). This also shifts the head back enough to use the beam converging attachment, effectively creating a multi-mirror telescope (MMT), which will be discussed shortly. Fine focus is achieved by adjusting the 2-inch helical focuser individually at the eyepiece. 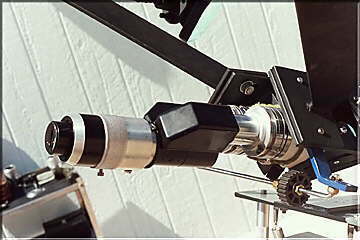 Note the make-shift [three-port] aperture stop at right, which is used to stop down the incoming parallel light path off-axis, thus increasing the effective focal length and resolution for observing brighter, finite solar system objects, etc. The inter-ocular distance is adjusted with the horizontal black knob on the right, just below the helical focusers (shown in both close-up head assembly pictures below). This separates the individual tertiary assemblies via pivot points just behind the center of each secondary flat. A MULTI-MIRROR TELESCOPE: A binocular viewer attachment (briefly mentioned earlier) can give spectacular views of solar system objects. By reversing the intended function of a typical binocular viewer, which consists of a simple pyramidal prism array with a beam splitter at its heart, we create a beam-converging system. By utilizing this device backwards, we can take the light path of two mirrors and combine them into one image, to collectively double the light grasp of an otherwise single objective. To my knowledge, prototype multi-mirror telescopes (MMT) designed and built by amateurs have failed to meet the final test. Admittedly, my MMT system does need perfecting, but the concept is sound, and it does work. Of course, the concept is limited to two objectives, but after experimentation, I find I prefer binocular viewing over monocularity. This may sound odd, but until you've experienced binocular vision, don't dismiss my claim too quickly. Binocular viewing involves many subtleties that, when combined with the complexity of the human mind, go far beyond the capabilities of monocular vision. CONCLUSION: For some inexplicable reason, binocular telescopes excel when observing dark nebulae along the Milky Way. The three-dimensional illusion appears very strong when viewing dark nebula. The surrounding stars seem to be positioned at discernible distances from the nebulous clouds, and these clouds seem to be glowing around the edges - maybe from reflected starlight? When viewed from dark sky locations under good seeing conditions, all the little-known fuzzy blobs become Orions and Dumbells times two. For brighter deep-sky objects, the binos become a teleportation machine into the living color of deep space. The delicate filamentary structure of the peculiar galaxy M82, or that of the Veil supernova remnant, display better clarity and depth than any photograph could ever capture. Scanning the constellations of Sagittarius and Cygnus reveals endless hunting grounds for elusive and mysterious phantasms that don't seem to be on the charts or in the books. What a fantastic comet hunter these deep-sky binos would make!